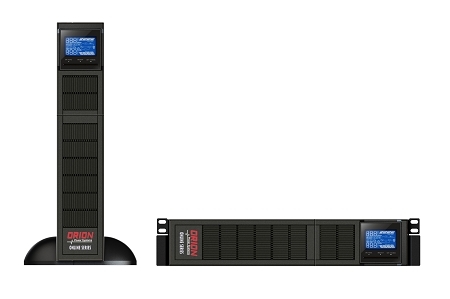 Orion Power Systems Online RT 3000VA true online UPS rated at 3000VA/ 2400 Watts. Flexible rack/tower design, features include double conversion topology, true sine wave output, (4) 5-20R (1) L5-30R receptacles, and optional SNMP and Relay cards for network monitoring. Dim. 3.5"H x 18"W x 24"D / Weight 66 lbs.